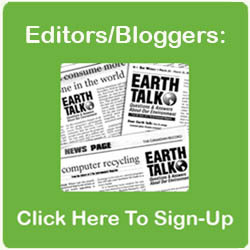 Dear EarthTalk: Are self-driving cars good for the environment? You know the future is here when you see that the car beside you at a red light has nobody at the helm. That’s already happening in California where a few companies (Uber, Google, Apple, Tesla) have begun testing autonomous vehicles on the open road—albeit with human drivers at the ready in case anything goes wrong. Meanwhile, the major automakers have begun integrating autonomous driving technologies (blind spot detection, GPS mapping, assisted parking, etc.) into existing models, and will surely offer their own fully self-driving cars once lawmakers qualify them as street legal, maybe as early as 2018. 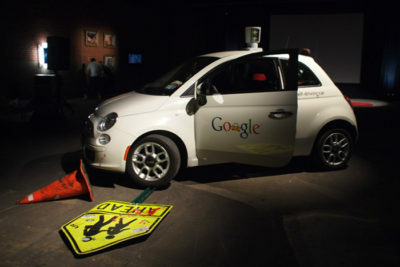 Google’s self-driving car prototype can be spotted on surface streets and highways around the company’s Mountain View, California headquarters. Credit: Becky Stern, FlickrCC. Proponents say that not only will driverless cars make our roads safer (as they can sense walkers, bikers, other cars and road infrastructure to avoid collisions), but will also be a boon to the environment. Zia Wadud, who co-authored a study released earlier this year assessing the travel, energy and carbon impacts of autonomous vehicles, says the widespread adoption of the technology could reduce energy consumption significantly. “Automated vehicles can interact with each other and drive very closely as a ‘platoon’,” reports Wadud. “This can reduce the total energy consumption of road transport by 4% to 25%, because vehicles which follow closely behind each other face less air resistance.” Beyond the platoon benefit, driverless cars can also shave another 25 percent off overall automotive energy consumption through more efficient computer-assisted ride optimization. Yet another environmental benefit could be fewer cars on the road altogether. “Your car could give you a lift to work in the morning and then give a lift to someone else in your family—or, for that matter, to anyone else: After delivering you to your destination, it doesn’t sit idle in a parking lot for 20-plus hours every day,” report MIT researchers Matthew Claudel and Carlo Ratti in a recent McKinsey.com article. “By combining ride sharing with car sharing … it would be possible to take every passenger to his or her destination at the time they need to be there, with 80 percent fewer cars.” They conclude that clearing four of five cars from the road would have “momentous consequences” for our cities regarding pollution, traffic, efficiency, and parking.